A Chinese official dismissed reports of Beijing establishing “political re-education camps” for Uighur Muslims in western Xinjiang province on Thursday, telling reporters that the camps are “vocational centers” necessary to integrate less wealthy citizens into the Chinese economy. 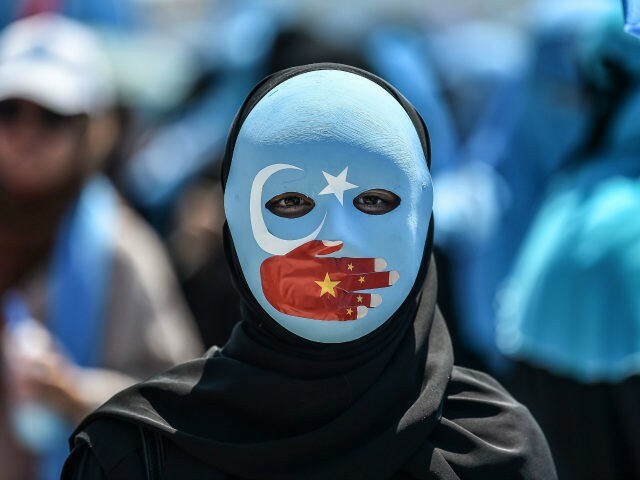 China has faced accusations of repressing the Uighur population, ethnic Turkic peoples who are predominantly Muslim and do not identify with the majority Han population, for years. Authorities in Xinjiang banned individuals wearing beards or Islamic garb from public transportation in 2014 and have since moved to shut down mosques, ban children from practicing Islam, and impose the Han Mandarin language over the Uighur population. On Monday, the NGO Human Rights Watch published a report revealing that the Chinese government has essentially cracked down on the entirety of the world’s Uighur population, detaining entire families in “re-education camps,” placing free citizens of Xinjiang under complete surveillance, and forcing those at home to pressure relatives abroad to come home or promote the interests of the Communist Party. Li Xiaojun, director for publicity at the Bureau of Human Rights Affairs of the State Council Information Office, responded to reporters’ questions at the United Nations on the new report on Thursday, insisting first that no “mistreatment” of Muslims occurs in the country and, later, that the mistreatment that the Communist Party is allegedly not committing is necessary to curtail terrorist threats. Li then criticized those in the West accusing China of human rights violations, asserting that Western powers have “failed” to “deal with Islamic or religious extremism.” Li went on to refer to re-education camps as “the trademark product of eastern European countries” without noting that the ideology that constructed those camps in that region is the same as the one currently governing in Beijing. Li’s claim that the camps merely exist to help Uighurs find more job opportunities differs significantly from the claims in the Human Rights Watch report, which cites five individuals who lived in the camps first-hand and 58 former Xinjiang residents total. The NGO details “mass arbitrary detention, torture, and mistreatment of Turkic Muslims in Xinjiang” as well as “the systemic and increasingly pervasive controls on daily life there” on people not kept in the camps themselves. In the latter category are such violations of human rights as forcible extraction of DNA for police records and the use of artificial intelligence to monitor the moves of every resident in some towns and cities. “Those outside the camps are required to attend weekly, or even daily, Chinese flag-raising ceremonies, political indoctrination meetings, and at times Mandarin classes,” Human Rights Watch notes. According to the report, up to one million people are believed to be living in the political camps; a similar report in Radio Free Asia suggests that one out of six Uighurs in Xinjiang have been detained in such a camp. Those who have escaped say they were told they must cross a certain threshold of patriotism to leave, such as learning over 1,000 Chinese script characters, not typically used in Uighur language. “The human rights violations in Xinjiang today are of a scope and scale not seen in China since the 1966-1976 Cultural Revolution,” the NGO concludes. Prior reports published by the U.S. State Department and other NGOs found reports of communist officials forcing Muslims to eat pork, listen to and watch hours of pro-Xi Jinping propaganda a day, and replace their language with Mandarin. On Tuesday, the Chinese Foreign Ministry accused Human Rights Watch of “prejudice against China” and fabricating their report. On Wednesday, China’s Global Times propaganda newspaper published a defense of the repressive policies in place in Xinjiang, as well as the many repressive tactics used to subdue the Christian population in the country, which is more geographically dispersed than the Uighur population. “Relevant management of the nation involves issues such as the existence and registration of churches, the appointment of clergy and whether religious sites are in compliance with regulations,” the piece asserted.